The rhino-excitement started as soon as we arrived in Sauraha, one of the towns where we stayed on the edge of Chitwan National Park, Nepal (blog here). We decided to take an evening stroll before dinner down near the river. We soon stumbled upon a gaggle of people watching a young bull rhino leisurely browsing on the vegetation between the street and the water. The rhino didn’t seem to mind all the attention, and happily continued munching away whilst we watched in awe. A local man told us that this particular rhino had been injured as calf, so had been hand-reared and subsequently released back into the wild. Although he is free, his familiarity with humans meant that he has never strayed far from the town. Whether or not he didn’t notice or just didn’t care, the young bull ended up wandering quite close to a group of tourists waiting to board canoes on the river. There were a few shrieks from the startled tourists and people began clambering to get out of the way. This commotion then in turn startled the poor rhino who decided he needed to get away, quick. Unfortunately, the path of least resistance was up the track which joined the street! Once on the street, the rhino didn’t know which way to turn with people both left and right scrambling about running into shops yelling and laughing. Our local acquaintance said that this wasn’t the first time it had happened. Eventually, the rhino came jogging back down the street and then took one of the little snickets which led back into the vegetation. No sooner had he entered the long grass, he started grazing again. Phew! We both felt very relieved that no-one had been inadvertently trampled, and that our young rhino friend was safely back where he belonged filling his belly. Before we continue, we should really give you an introduction to our real-life unicorn and his family. Check out our Fact-File below. Population: There are approximately 3,500 individuals living in the wild as of 2015. At there lowest point in the 1900s, their total population was less 200. Distribution: Currently there are only a few subpopulations in Nepal and India. The species is confined to fewer than ten sites, with a total extent of occurrence of less than 20,000 km². You can see just how restricted their distribution currently is when you consider that they once ranged throughout the entire stretch of the Indo-Gangetic Plain, a whopping 2,550,000 km². Biology: It is estimated that they live for around 30-45 years. The gestation length is approximately 16 months. The age at which they reach sexual maturity is estimated at 5-7 years for females and 10 years for males. Threats: The primary cause of their decline was the widespread conversion of alluvial plains grasslands (the rhinos primary habitat) to agricultural development, which led to human-rhino conflicts and easier accessibility for hunters. This hunting was an important factor in their historical decline, hunted for sport by both Asians and Europeans. Although hunting is now banned, poachers killing rhinos for their horn is still a serious threat, as is the continued habitat loss and habitat degradation. 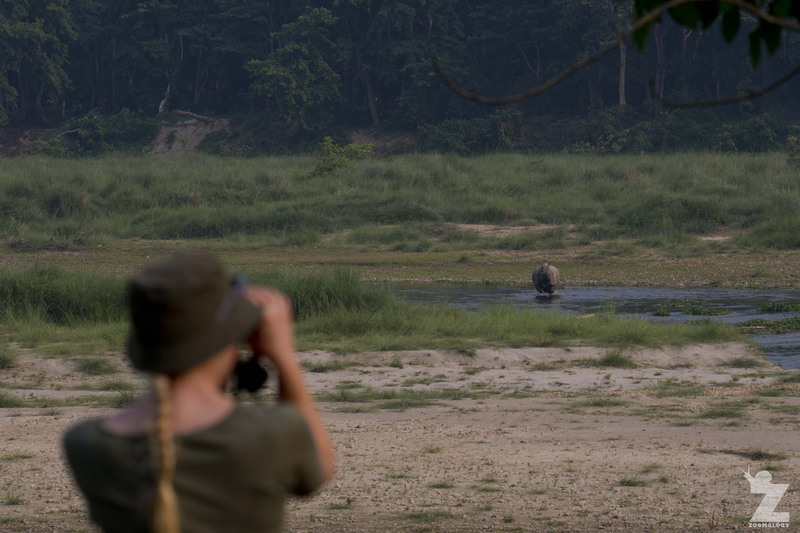 The following day, we headed into Chitwan National Park on a two-night trek. Although we had seen the semi-tame young rhino in town, neither of us had ever seen a rhino in the wild before. First of all, we found some evidence the rhinos had left behind. Rhino footprints in the sand. With Tom looking through his long lens and me honing in on the large creature with my binos, we had just spotted our first wild rhino! 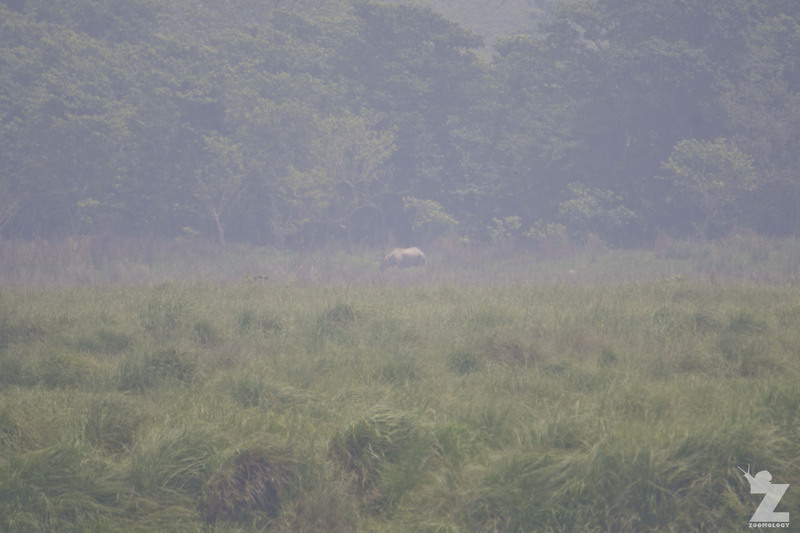 A while later, we spotted these two rhinos grazing on the jungle track just down the slope from us. Tom managed to snap these lovely up-close shots. Aren’t they gorgeous animals? There’s something about those fluffy ears following you that makes them very endearing. We started walking away from the two rhinos, but they were disturbed by our movement and began jogging along a parallel track which ended up converging on the same track ahead of us. We could see the rhinos deliberating whether or not to run towards us, or just to take a perpendicular track. We inched towards suitable trees as silently as we could (if they charge at you, the aim is to always stay on the opposite side of the trunk because they can’t make sharp turns). Luckily for us, the rhinos chose not to have a face-off. An almost-too-close encounter it was indeed! The last rhino encounter we photographed was seen at the jungle tower we slept in on our second night. From the river bank below, we had a perfect view of where this particular rhino liked to come and wallow to escape the heat of the day. The heat was sweltering, with high humidity and temperatures approaching 40°C. Tom and I would have joined him if we didn’t think we’d be snatched by march mugger crocodiles. It was such treat getting to be amongst these guys doing their thing in the wild, and it was a certainly a sight neither of us ever thought we’d get to see with our own eyes. It is well worth supporting ecotourism in these areas. 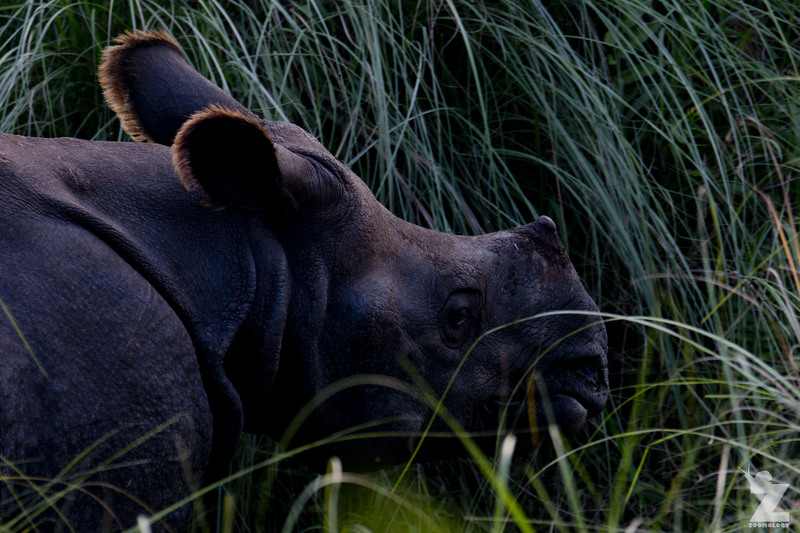 With the rhinos bringing in tourists and money, the drive to conserve and grow their populations only increases. Many thanks to our wonderful guides at United Jungle Services. 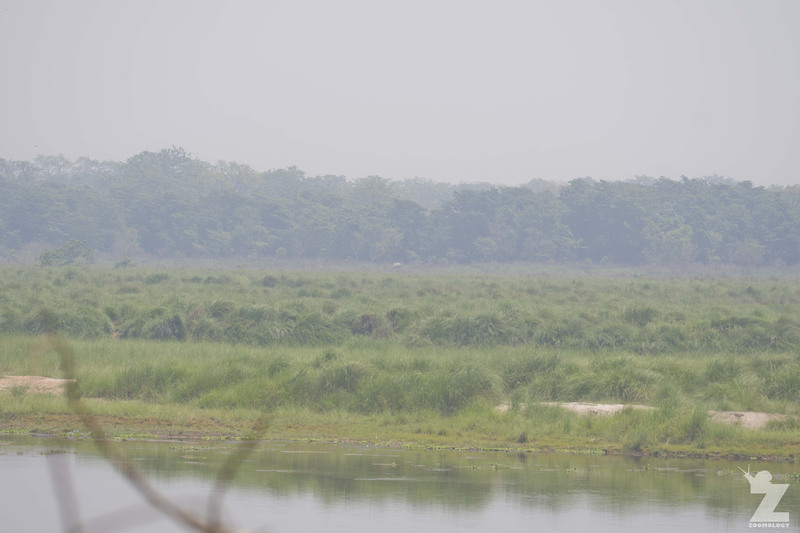 Until next time, Chitwan National Park! Thank you for sharing these amazing photos. I can imagine that your hearts were beating wildly when you thought you might be charged! Lips are adapted to both graze and browse, with the lower resembling that of a white rhino, while the upper more resembles that of a black rhino. How interesting. Thanks for the info. What a fantastic animal, big congrats on seeing them in the wild. I appreciate the play on words about running with the title like a young rhino bull. This looks like an incredible experience, and I’m really glad you didn’t get charged at!